It has been a while since I used a Jamberry Nail Shield, so I thought I'd grab one and find a polish to match. 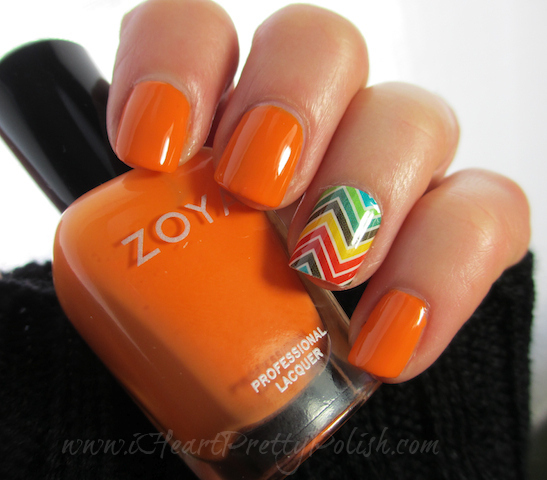 This is the Multi Color Chevron design paired with Zoya Sharon. I got Zoya Sharon when they had their recent special where if you order $25 worth of Zoya products, you get the Limited Edition New York Fashion Week Color inspired by Peter Som, Sharon. Sharon is described as a creamsicle orange. 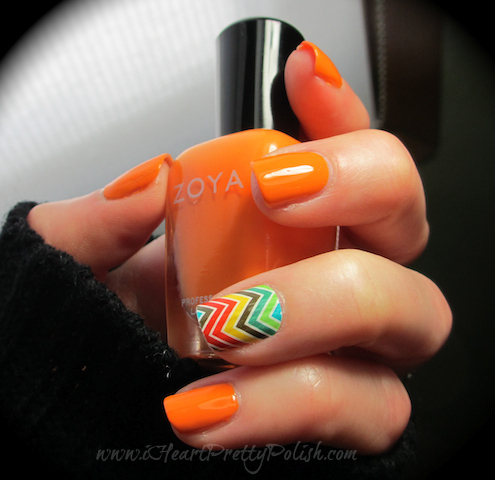 I wouldn't have chosen this one out of a line-up, but I had to buy my $25 jug of Zoya Remove+ and why not order it when I can get free shipping and a free polish?? I received the Jamberry Nail Shield on a sample sheet that I received with an order I made through Kelly Baas. I can't wait to show you the shields that I bought, I LOVE them. 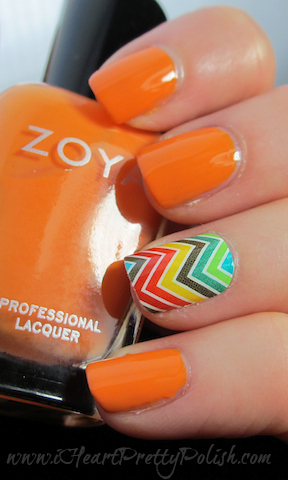 Be sure to "Like" Kelly Baas and Zoya's Facebook for notifications of sales and specials. I hope this manicure brings you some sunshine and happiness:) I'm off to bring my oldest daughter to Oz, the Great and Powerful. I love this combination Essie!!! It's bright and sunny here in Southern California so I may snag this idea for my next pedicure ;) Even though it's cold & snowy there it should brighten your day a bit! I hope so:) Thanks for commenting! Thanks! What kind of winters do you have there? You don't have snow, do you? I love the color brightness! Fun Jamberry! I really like Sharon, too, though I didn't pick it up. It seems to be a slightly redder orange than Arizona (which I really didn't care for at all). 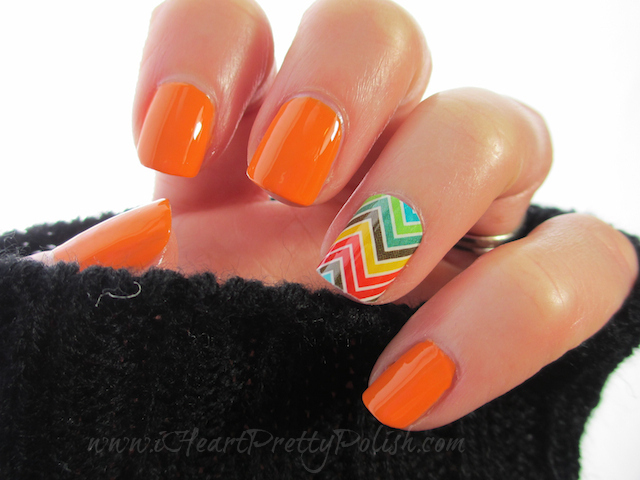 Very pretty orange, and the nail shield is a fun accent! Thanks a lot. It's fun to wear! I love the strip as an accent! This is a gorgeous look! I love Sharon on you! Those Chevrons make a perfect accent too. This is a great combo! This is probably how I would wear one of those nail shields, as an accent nail. Yep, that's my favorite way. Thanks! It definitely brings sunshine - what a gorgeous orange...! I know, I was surprised at how much I liked it. Oh my goodness i LOVE this! Thanks for sharing. You are welcome. Thanks for commenting.